This past week, y'all. I don't understand. Why am I so emotional? What is happening?! Someone check the damn horoscopes and tell me what the deal is! This past weekend, I happily joined fellow moms/dads and bloggers at Disney's Social Media Moms Celebration. I proceeded to cry through most of the presentations. If I didn't have tears in my eyes, it was probably because I was busy thinking of ridiculous things so that I wouldn't get tears in my eyes. Halfway through Friday I thought "oh! Maybe it's because it's Mother's Day weekend!". Seriously, that's when hit me. It wasn't just that, though. I never know. As time eases on by, I keep expecting holidays to get easier but they don't. Add to that ongoing health issues that I'm dealing with and the Frog Princess's febrile seizure last weekend and I believe this could very well classify as the perfect storm of emotions. But, I plugged along. I celebrated with my friends as best I could, I headed to Magic Kingdom on Saturday to spend a few hours being present and actually NOT going on the carousel or Dumbo the Flying Elephant (the struggle is real!). We headed to Adventureland and found ourselves some new fun. It was so nice. What wasn't nice was how the Frog Princess suddenly announced that she didn't feel well and had me nervously trekking back to the hotel fearing that she'd spike a fever and have a seizure. Ahhh! PTSD, there you are! Saturday night found me at a Kentucky Derby Soiree fundraiser. Even though I'd cried earlier that day (and the day before), I donned my custom fascinator made by Suzanne over at Pippa and Pearl and off I ran to slay. The truth is, I don't have time to wallow. There's too much beauty for me to ignore. 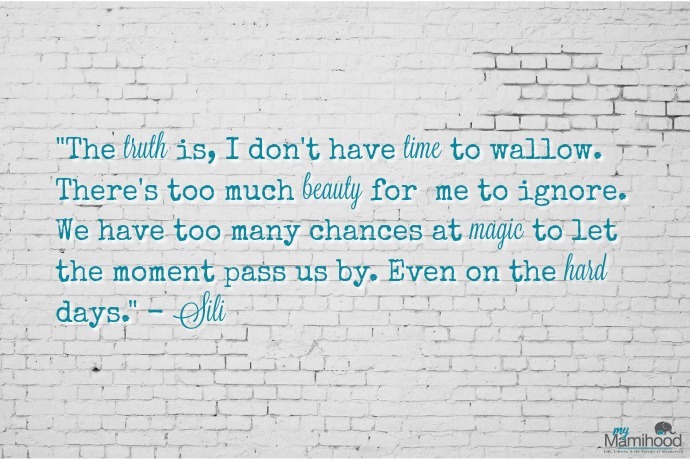 We have too many chances at magic to let the moment pass us by. Even on the hard days. Some days I think not wallowing is a bad thing but this time around I felt it helped me through my days. It gives me perspective and allows me to be grateful even in tough situations. Eucaristeo, as Ann Voskamp calls it. The hard blessings. What I am not is apologetic for the emotions. Judge if you'd like but if you have never had to roller coaster from one emotion to the next then honey, I am truly sorry for the lack of living that you seem to be doing. Maybe it's just me. But I'm not a single emotion woman. I guess that's how I can celebrate, sob and slay all in one day. Because my faith makes me flexible and my hardships force me to be present to capture the magic all around me. And though it might seem strange, I'm humbled and grateful for it all.